Have you ever had a great bucket idea you’ve wanted to share? Now’s your chance. This summer we’re working with Workshop Solutions to give away bucketloads of great prizes to Five Gallon Ideas readers. There’s almost 1000$ of prizes on offer – and all you have to do is send in a five gallon idea of your own! “Like” the Workshop Solutions facebook page using the button below, then post a clear photo to the Workshop Solutions Facebook page of how YOU use buckets in your work or daily life. A detailed description helps! Great examples of past reader submitted ideas include the bucket mailbox, an ingenious cider press and the bucket bed frame. The contest will wrap up at the end of summer 2014. The winner will be judged based on several factors including originality of idea, usefulness, and the number of Facebook “likes” on their submission. 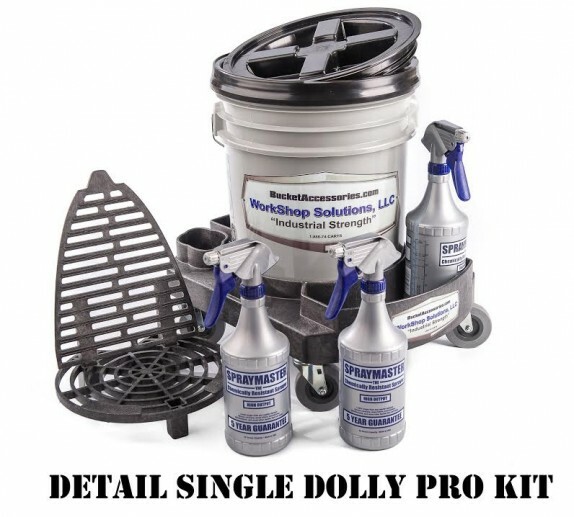 Our third prize winner will receive the Detail Single Dolly Pro Kit­ – A great companion for a perfect car wash. 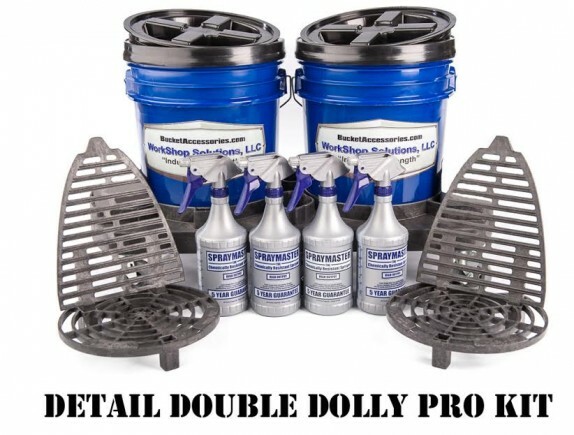 The package contains 3 spray bottles for formulas and cleaners, a bucket dolly, and a screw-on Gamma lid. Included is the Dirt Dropper, a bi-directional wash board that will remove dirt from any direction. An $87.95 value. Win second prize and we’ll double the offer. 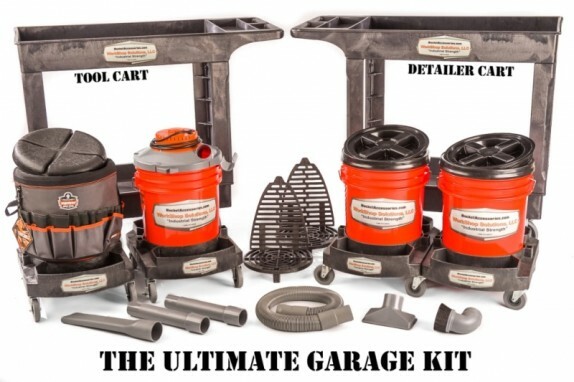 You’ll have enough equipment to wheel around both wash water and rinse water. These dollies simply bolt together to make moving them around a breeze. A 169$ value from Amazon – can be yours free exclusively through this contest. 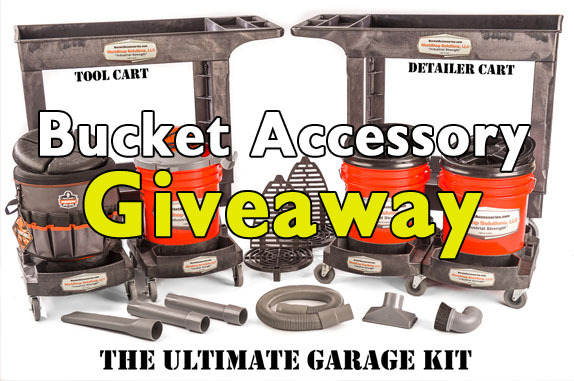 And our grand prize winner will have several boxes delivered to their house, filled with a mountain of bucket accessories. It’s the Ultimate Garage Kit. (2) Gamma Lids and 1 Bucket Seat to top your buckets off and protect their contents. (1) Heavy duty BucketVac industrial wet/dry vacuum with attachments – fits a standard 5 gallon bucket! We’ll send out a few contest reminders via our mailing list so sign up now if you’d like to keep up-to-date on contest details. No purchase necessary, prizes will be shipped free to anywhere in the contiguous 48 states and Canada. International winners will be contacted to make separate arrangements. Non-Proprietary: Five Gallon Ideas and Workshop Solutions LLC. considers any suggestions, ideas, proposals or other material submitted to it by users whether solicited or unsolicited, (collectively, the “Material”) to be non-confidential and non-proprietary. Five Gallon Ideas and Workshop Solutions shall not be liable for the disclosure, use or exploitation of such Material. License: You hereby grant and agree to grant Five Gallon Ideas and Workshop Solutions LLC, a worldwide, non-exclusive, perpetual, irrevocable, royalty-free, sublicensable and transferable right and license to incorporate, use, publish and exploit the Material for any purpose whatsoever, commercial or otherwise, without compensation or accounting to You. Toss to sort. I’m not sure how familiar you are with coin roll hunting? The simple of it is you get a bunch of say….penny rolls. You go thru them looking for anything 1982 an earlier because those are still made from copper. Different coins have different things to look for. The way I sort is two or more buckets with a backboard [cardboard box] with year and denomination on it. It I find a penny that is 1982 or earlier, I toss it in the bucket. 1958 and earlier also needs a bucket. All the ‘not as valuable’ coins get dropped into the bucket between my legs to be spent on whatever the kids are doing these days. Warning, a full bucket of coins is pretty heavy, switch out when it is half full/half empty? I have amassed about 50 five gal buckets, and about 68 two and a half gal buckets (lighter to carry when full for my age). Their use varies from standard tool buckets with Bucket Boss organizers attached, rolled garden hose storage, rolled extension cord storage, a five gal bucket with immediate use plumbing tools inside (if I encounter a water leak I already have a bucket handy), buckets to hold my ‘concentrates’ from prospecting to pan latter when time permits, you name it! If any situation calls for holding or hauling, I have a bucket for it!